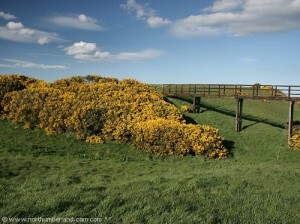 Warkworth - Alnmouth (South side of River Aln) - Warkworth. 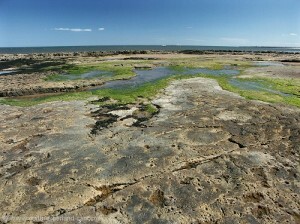 We timed the start of the walk to coincide with the hour around low tide to enable the crossing of Birling Carrs Rocks. If that is not convenient, the inland footpath via the Golf Course and Caravan Site can be taken and access to the beach north of the rocks gained beyond the site. Distance Walked - Approx. 6.5 miles. 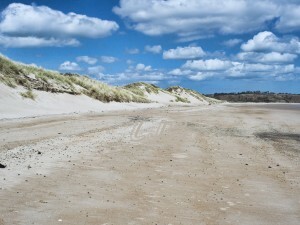 Parking - car park for Warkworth Beach on the road to Warkworth Golf Course. Toilets - in car park. 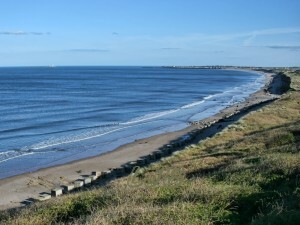 View south from the dunes towards Amble. 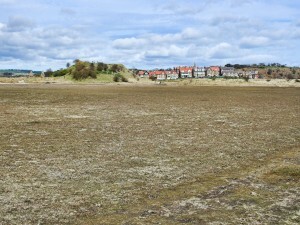 Alnmouth as seen across the River Aln. 1) We left the car park and followed the footpath towards the dunes and beach. 2) The path skirts the south end of the Golf Course. We turned left along the path that heads north between the dunes and Golf Course. 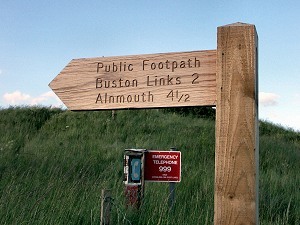 An emergency phone post was located at the point where we turned left, together with a footpath sign to Buston Links and Alnmouth. 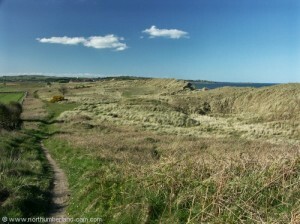 3) After a short while the path left the edge of the Golf Course and entered the dunes. 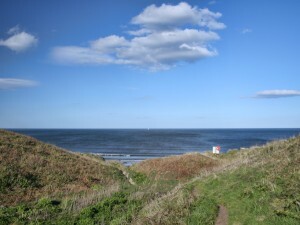 A short detour here to the top of the dunes provided great views back down the coast to Amble and north to Birling Carrs rocks. 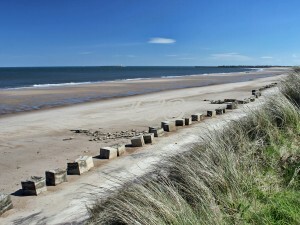 View from the dunes looking north. 4) After a while the path turned left inland up a gulley, but instead we turned right and down onto the beach. Walking north along the beach we soon reached Birling Carrs rocks which afford great views to the north and south along vast empty beaches. Care was needed when crossing these rocks which are submerged at high tide (the reason this route was taken at low tide) and are likely to be slippery in places at all times. 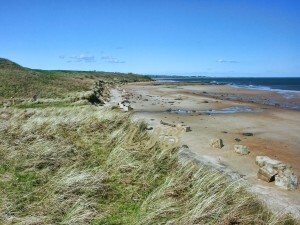 5) We then walked north along the beach toward the mouth of the River Aln past very steep dunes. On windy days the sand can be lashing across the beach here so camera protection is advisable if taking photos. 6) When we reached the mouth of the River Aln we turned along the south shore towards the headland upon which is perched a large wooden cross. 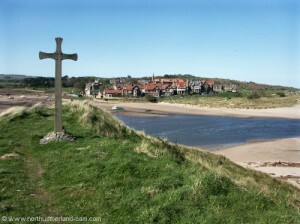 This is Church Hill and the view across the river to Alnmouth is worth spending time to savour. 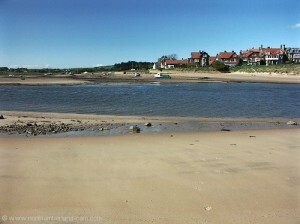 Alnmouth seen across the River Aln. Cross on Church Hill and view to Alnmouth. 7) To start the return leg we followed a path that leads into the dunes around the edge of some mud flats. 8) There are numerous little paths heading in all directions here so it was really a matter of picking our way through. The path we took turned right and emerged from the dunes to a track and parking area. 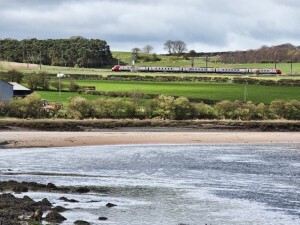 In the distance the main road from Alnmouth to Warkworth and the East Coast main line railway could be seen. Mud flats behind the dunes. East Coast main line railway. 9) We followed the track south which was flat for a while before rising quite steeply into the dunes again and skirting farmland to the right. 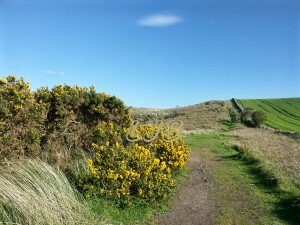 View back along the path behind the dunes. 10) The path soon reached a caravan park which we passed through to emerge back at the Golf Course. 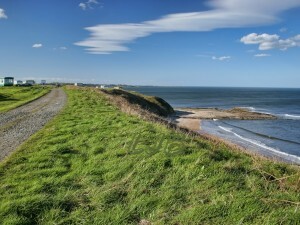 View south towards the Caravan Site. 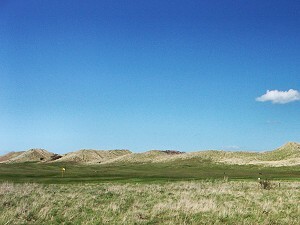 Track alongside the Golf Course south of the Caravan Site. 11) Once again there were great views down to the beach and rocks. View to the beach and rocks. 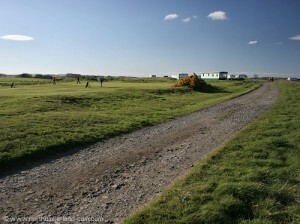 12) Walking along the track at the edge of the Golf Course we turned inland across the course and then south again. 12) The path turned right at the end of this gulley and we rejoined the route at this point where we walked down to the beach. 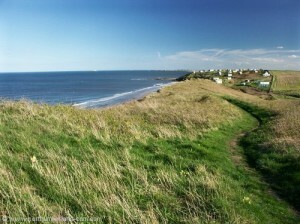 We followed the path back from here to the car park, but a detour could be made along the beach. View out to sea from the path through the gulley. - Care needed at Birling Carrs Rocks. - Best done at low tide. - Map - OS Landranger 82 - Alnwick, Morpeth & Surrounding Area.